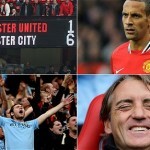 Sir Alex Ferguson described Manchester United’s 6-1 defeat against Manchester City as an embarrassment and admitted Roberto Mancini’s team subjected him to his worst ever day in management. Ferguson, who celebrates his 25th anniversary as United manager on Nov 6, witnessed his club’s biggest derby defeat since another 6-1 loss to City in January 1926 just one short of United’s record home defeat, a 7-1 loss to Newcastle in September 1927. Playing with 10 men following the 47th-minute dismissal of defender Jonny Evans, United on Sunday capitulated in the dying stages as City ran in three late goals. But with City moving five points clear of United with their emphatic victory, Ferguson admitted he had never experienced such a dark day as a manager. It was our worst ever day, Ferguson said. It’s the worst result in my history, ever. Even as a player I don’t think I ever lost 6-1. I can’t believe the scoreline. The first goal was a blow for sure, but it was retrievable at 1-0. I’m shattered, I can’t believe it. It was an incredible disappointment, but we will react, no question about that. It’s a perfect result for us to react to because there is a lot of embarrassment in the dressing room and quite rightly so and that will make an impact. You have to recover. The history of Manchester United is ‘another day’ and we will recover. The humiliation of United’s defeat resulted in the club’s American owners, the Glazer family, being barracked and jostled by home supporters as they travelled from the players’ tunnel to an awaiting helicopter. Sources in the tunnel reported angry chanting outside as the Glazers left the stadium for their transport to Wembley for the NFL fixture between their Tampa Bay Buccaneers team and the Chicago Bears. Rio Ferdinand, the United defender, cancelled his plan to travel to the game for a guest appearance on the pitch. 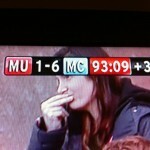 With three City goals coming in the final minutes, however, Ferguson insisted that United contributed to their downfall. The sending off was the killer blow, Ferguson said. After that, we kept attacking. I thought with the experience we’ve got Rio Ferdinand, Patrice Evra they would have [defended more] but we just kept attacking. It’s all right playing the history books [United’s reputation for fighting back] but common sense has to come into it. When we went to 3-1, 4-1 we should have settled for that. 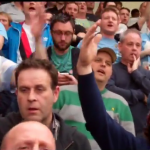 We kept attacking when we went 4-1 down and we should have just said: ‘We’ve had our day’. They were attacking three versus two. It was crazy football and it was a bad day. But we’ll come back. By January, we’ll be OK. We usually get the show on the road in the second half of the season and that will have to be the case. Over the years we have always enjoyed a better goal difference than our rivals but after today, we are 10 goals short. 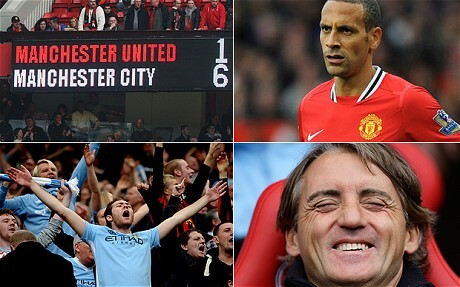 Despite his team’s incredible victory, City manager Mancini played down the significance of the result. I’m satisfied because we beat United away and I don’t think there are a lot of teams that could win here, he said. But I’m not satisfied for the 6-1 it’s because this is important for our supporters and maybe for the goals in the table. I am happy with the three points. Against Tottenham we played very well and against Bolton, but this is different because we played against a strong team like United. In the end there are three points, finished, we don’t take six points for this game. I think the season will be very long and probably four or five teams that can win the title. This is important for our confidence, it’s important because we showed that we are a good team, but we should appreciate the mentality United had because after 1-0 and the sending off, they continued to play to score. I think that’s a very important mentality. Mancini, who shared a post-match drink with the United manager, claimed he took no satisfaction from humiliating the Scot. No, because I have big respect for him, Mancini said. I have big respect for United because we are talking a top manager and a top squad. I still think United are one yard above us. I think we can only change this after we win the title in the end. After, maybe it will be different, but now United are better than us.